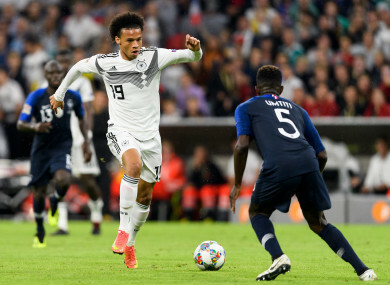 Sane taking on world champions France last night. LEROY SANE WILL miss Germany’s friendly with Peru after leaving the team’s hotel for “personal reasons”. Sane made a seven-minute cameo in Germany’s Nations League opener with France last night, but he was unable to make the difference as the two sides drew 0-0. Less than 24 hours on, Germany have announced Sane has left the group. The 22-year-old winger has endured a difficult few months since being nominated for various individual Premier League awards at the end of last season. He was surprisingly left out of Germany’s World Cup squad, before then also losing his place in Manchester City’s starting XI at the start of this season. Pep Guardiola, who said Benjamin Mendy’s form justified such a decision, even left Sane out of his squad entirely for the 2-1 win over Newcastle United. Germany confirmed Sane did have discussions with national team coach Joachim Low before leaving their hotel today. It remains unclear as to why Sane – whose attitude was questioned earlier in the week by Germany team-mate Toni Kroos – has left, although Bild have suggested it is because his girlfriend is expecting a child in the coming days. Sane has 13 caps to his name so far. Email “Man City winger Sane leaves Germany camp due to 'personal reasons' ”. Feedback on “Man City winger Sane leaves Germany camp due to 'personal reasons' ”.